On December 1st, 1915, at the ripe age of seventy-six, Mr. Matthew Seaton died at Belton, the Lincolnshire village where he had resided the whole of his life. 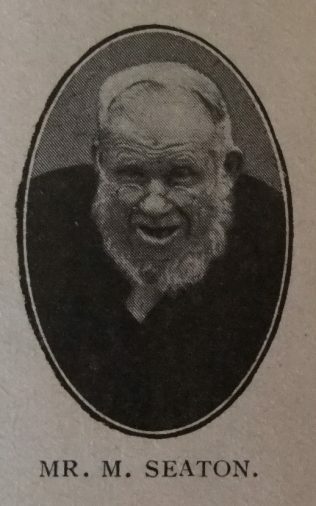 For more than half a century he had rendered unstinted service in the Epworth Circuit as local preacher, class leader, trustee, school and chapel secretary, etc. He was a “character” in Primitive Methodism, and his name a household word for many miles around. If the poor are God’s treasures, then Matthew Seaton was indeed a divine jewel. In his old age he received help from the Local Preachers’ Aid Fund, always signing the receipt upon his knees and breathing a prayer of thankfulness to God. The Sunday he was buried he was planned to preach in Belton Westgate chapel, where around his mortal remains an impressive funeral service was conducted by Rev. W.H. Nicholas. A memorial service was conducted on Sunday 19th, by Mr John Fox, J.P. A marble tablet is being erected to his memory in the chapel. Matthaw baptised on 6 January 1839 at Belton, nr Epworth, Lincolnshire. His parents were Edward and Sarah. Edward was a Cordwainer, the trade that Matthew also followed. Matthew remained a bachelor.